Annnd we got another winner here, folks! 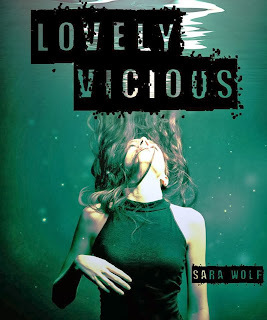 I did nothing but laugh over Sara Wolf's LOVELY VICIOUS. The song, One Week by Bare Naked Ladies, was playing in my head the entire time I was reading. It's kinda old but the beat encapsulates the tone of LOVELY VICIOUS perfectly in my head. LOVELY VICIOUS is a contemporary YA novel that's snarky, ballsy and wickedly funny with a dash of serious "adult" themes like escorting, domestic abuse to provide contrast. Isis Blake and Jack Hunter will have you rolling with laughter in the first chapter and I seriously wish someone turns this into a movie. LOVELY VICIOUS to me felt like an inverted version of that oldish movie, 10 Things I Hate About You (1999) and by extension, Shakespeare's Taming of The Shrew. Except the shrew in this story is a boy, our drop-dead-gorgeous-Abercrombie-model-like hero, Jack Hunter, the Ice Prince of East Summit High. Jack is unreachable, a snob, mysterious and a jerk. Isis Blake in contrast is a troublemaker, an instigator and a rebel. One of the characters perfectly described Isis and Jack's chemistry, if I can call it that, she said they are both so alike they repel each other. Both are stubborn, fiercely independent, outspoken, intimidating in their unique way, witty and overall brilliant. And they are at war because Isis is out to punish Jack in behalf of the female population of East Summit High. Apparently, Jack has humiliated a lot of girls to tears by rejecting their adoration and other advances to get him to like them. Obviously this war is just foreplay and the ultimate ending is Jack's frozen heart is melted by Isis while Isis falls for her arch nemesis. But behind the brave facade and hilarious interludes, Isis and Jack are two suffering souls. Isis suffered from extreme bullying from an ex-boyfriend in her former school while her mom goes through therapy due to domestic violence. Now SWolf didn't overly dramatize those instances where Isis has to be the parent instead of the child, rather she gave us enough powerful scenarios to leave a strong impression that Isis' personal life is challenging. As for Jack, his backstory took a while to come out and a big part of the story is hinged on that so I'll just let it remain mysterious for now. All's I can tell you is he's a loyal friend and his means of demonstrating that loyalty is unconventional and even questionable but it's noble nonetheless. Aside from the colorful main characters, the secondary ones are just as entertaining. They fall under certain archetypes but I didn't really mind because SWolf did a spectacular job with the story and presenting each personality. The plot of the series as a whole runs deep pertaining to Isis and Jack's backstories. The conflict came a little late resulting to a cliffhanger ending which did not sit well with me. During the last few pages of LOVELY VICIOUS things got ugly and dark and I hope book 2 won't be too dark because I really love SWolf's sense of humor so I wish she won't abandon the series' playful edge in Savage Delight. Things are coming to a head in Jack's world and I have a feeling the sequel will be more about him than Isis. Overall, this is a Suped Up shot of YA. We all know it's much harder to make people laugh than cry so any book that has me laughing the entire time deserves a great rating from me. So if you'd rather giggle than weep, join the giveaway below or get a copy of LOVELY VICIOUS, it's worth adding to your already extensive library. I hope one of you wins! Lovely Vicious sounds amazing! I am really excited about this book, as i was drawn instantly to the original cover. Good luck, I hope you win a copy! It's a great title & I did enjoy the excerpt. I want! I want! I want! But I'm not sure if to wait for second book because I hate cliffhangers. You won't be waiting for too long because it'll be this January. Well thank you, Mel! I've become picky now so that explains why I've only been reviewing good stuff. How interesting! I would have never thought this book would be funny judging by the cover and title. True but it is very hilarious! I didn't know this one but I'm definitely curious. I don't see a lot of YA on your blog and it's intriguing. Plus, the two characters are really great to discover! This is a winner! You must read this! This book sounds great!!! High on my TBR!!! I usually don't read much YA that's not Paranormal or Fantasy anymore, but this sounds absolutely fantastic! Ok throwing this one onto my TBR pile. If you have suped it up :D Well done! Thanks, matey, I'm sure you'll love it too! I loved Ten Things I Hate About You and I think I'm going to enjoy this one! Then I'm sure you'll love this!